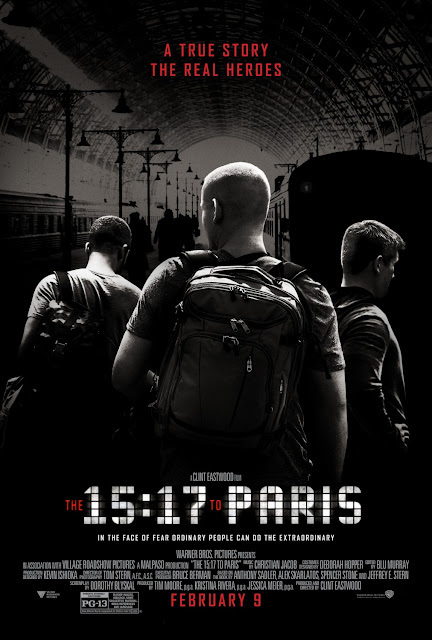 Movie: "The 15:17 to Paris"
The true-life story of how a group of unarmed men stopped what could have been a devastating terrorist attack on a train in France. See, you actually *don't* need a good guy with a gun to stop a bad guy with a gun! All you need is are few good guys with giant huevos willing to put themselves in danger to help others. "The 15:17 to Paris" is directed by Clint Eastwood, who has directed many amazing films like "Mystic River," "Million Dollar Baby," and "Gran Torino." Lately, Eastwood has been focusing more on real-life American heroes as the subjects of his stories. This movie is yet another true-life story of three Americans, U.S. Ariman Spencer Stone, Army National Guardsman Alek Skarlotos, and plain ol' civilian Anthony Sadler. Along with two French Nationals, these men thwarted a terrorist attack on a train to Paris. Though there were many heroes from several countries on the train that fateful day, this particular story is mostly focused on these three Americans (more specifically Spencer Stone) who had been friends since childhood. Nearly all of the people involved in the actual incident on the 15:17 train to Paris play their real-life counterparts in this film, with the exception of the French National that first engaged the terrorist and chose to remain anonymous for fear of repercussions, as well as the terrorist himself. Every single person on the 15:17 train owes a debt of gratitude to those who helped stop the terrorists that day. There is no disputing this fact. As brave as these men were in real life and as capable as they were when taking down an armed assailant, they are not actors. Because of this, they are incapable of delivering convincing performances even when they are reenacting moments from their own lives. We might have been able to give the movie a pass if these gentlemen were the only people giving bad performances, but even professional actors like Jenna Fischer and Judy Greer, who play the mothers of Stone and Skarlotos, are terrible here. They have been given some of the worst, most eye-rolling dialogue ever written, and they deliver these atrocious words in such an overly dramatic way that the Lifetime channel called and wanted royalties from them. Beyond the bad acting, the movie itself is an absolute slog. It drags at a snail's pace until the last 15 minutes, focusing on the childhoods and upbringings of Spencer Stone and his two friends, all of which leads to the most heroic moment of their lives. Instead of concentrating on the foiling of this terrorist attack, Clint Eastwood assumed the audience wants to see how these kids were raised and discover how one of their teachers thought one of the boys learning disability. It was difficult for us to maintain our interest in this project and it was a genuine struggle to keep our eyes open while watching this plodding disaster. It is one of the most boring films we have seen in a long time, until the final moments on the train, which only last about five minutes or so. A couple of mediocre-but-worthwhile moments in a 94-minute film does not make for a good viewing experience despite its incredible premise. We wish we could say we recommend "The 15:17 to Paris," but there are probably many other better, more entertaining ways to familiarize yourself with these men and their brave and selfless act. Just read their Wikipedia pages or buy their book instead.